With the winter holidays around the corner, Monster Hunter World is getting into the spirit with another new holiday update. This new update, dubbed the Winter Star Fest is themed around winter holidays, so expect to see plenty of snowmen around. Like other holiday updates, this newest update has a number of new goodies for you to collect. To help you collect the goodies, here is everything in the Winter Star Fest. When you login to the Winter Star Fest, you will get these rewards. 2x Lucky Vouchers: You can use a lucky voucher when posting a quest to add bonus rewards upon its completion. 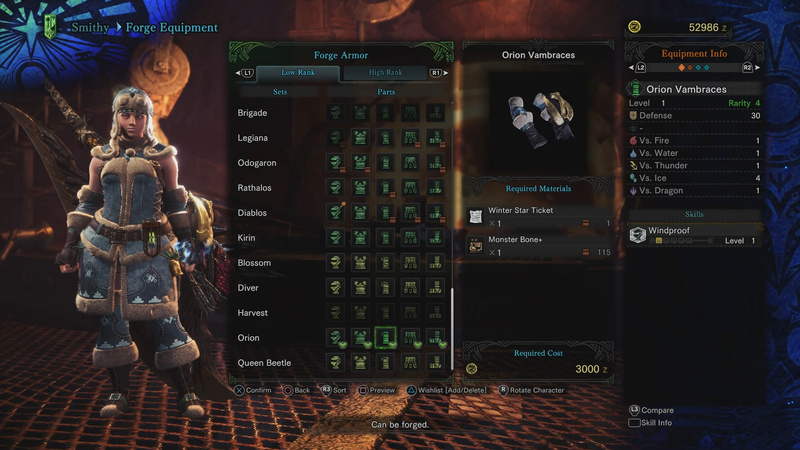 1x Winter Star Tickets: Can be turned into the workshop for the seasonal event armor sets. 3x Star Fireworks: Festive item which can be used during hunts. Shoots off fireworks when placed. This is what the Winter Spirit Coat outfit looks like on your handler. 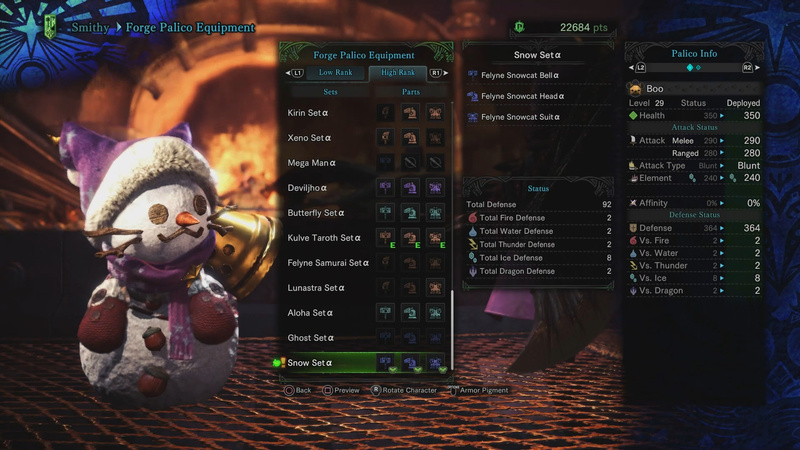 Your Poogie has a new winter themed outfit you can equip. 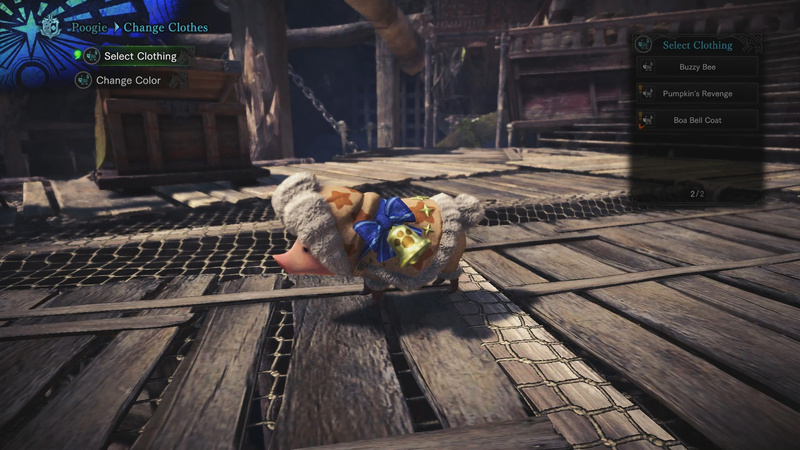 When you go to Astera for the first time after downloading the Winter Star Fest update, you may notice that both your Poogie and the Handler look a bit different. This is because both have been given new outfits to celebrate the Winter festivities. 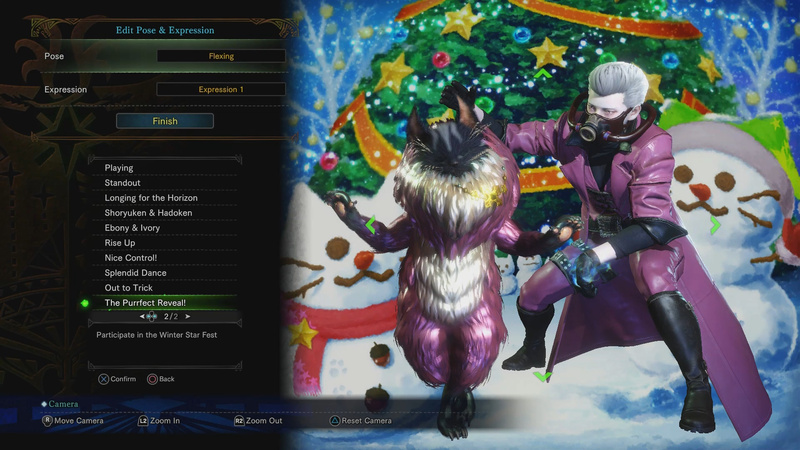 Your Poogie has on the outfit Boa Bell Coat, while the Handler is wearing the Winter Spirit Coat outfit. 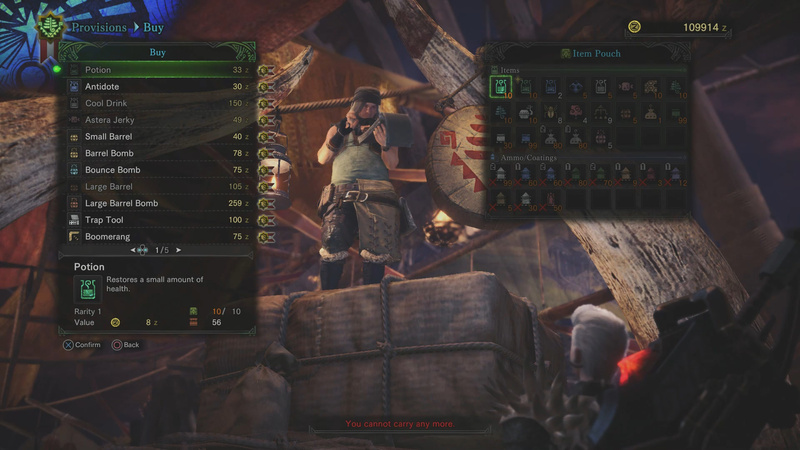 The Poogie’s outfit will unlock permanently, but the Handler outfit is only available for a limited time during the seasonal event, and will need to be purchased (with real money) if you want to use it indefinitely. Note: You need to head to the Gathering Hub to have the outfits appear. If you wish to change Poogie’s costume, simply interact with it and select the Change Clothes option. To change the Handler’s Outfit, talk with your Housekeeper and select the Change the Handler’s Outfit option. During the Winter Star Fest, you will find the vendors will sell items at a discount. This means you can stock up on things like the Large Barrel Bombs for cheap. Items for sale are denoted by the medal to the right of them on the buy screen (pretty much all items are on sale). 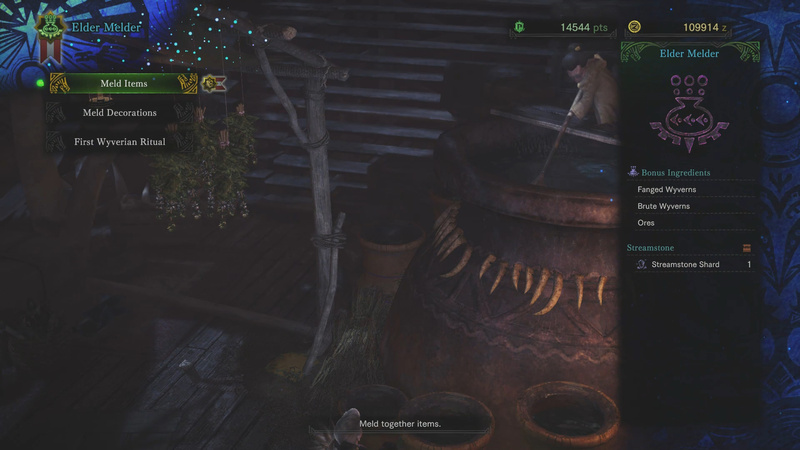 You will also notice that vendors like the Botanical Research Center and the Elder Melder are also offering items for lower prices. 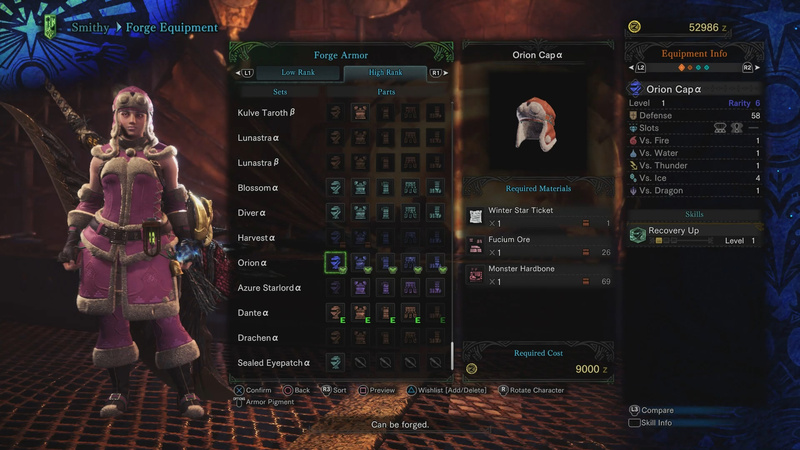 This is what the Orion Set looks like on a female hunter. Cap: 1x Winter Star Ticket, 1x Monster Bone+. Vest: 1x Winter Star Ticket, 2x Monster Bone+. Vambraces: 1x Winter Star Ticket, 1x Monster Bone+. Coat: 1x Winter Star Ticket, 1x Monster Bone+. Boots: 1x Winter Star Ticket, 2x Monster Bone+. This is what the Orion Alpha Set looks like on a female hunter. Cap: 1x Winter Star Ticket, 1x Fucium Ore, 1x Monster Hardbone. Vest: 1x Winter Star Ticket, 2x Fucium Ore, 1x Monster Hardbone. Vambraces: 1x Winter Star Ticket, 1x Fucium Ore, 1x Monster Hardbone. Coat: 1x Winter Star Ticket, 1x Fucium Ore, 1x Monster Hardbone. Boots: 1x Winter Star Ticket, 2x Fucium Ore, 1x Monster Hardbone. 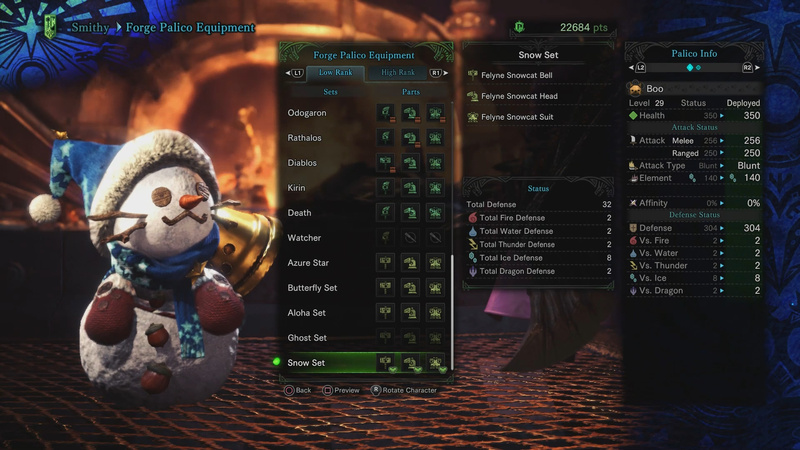 This is what the Palico Snow Set looks like. Bell: 1x Winter Star Ticket, 1x Machalite Ore.
Head: 1x Winter Star Ticket, 1x Machalite Ore.
Suit: 1x Winter Star Ticket, 1x Machalite Ore. 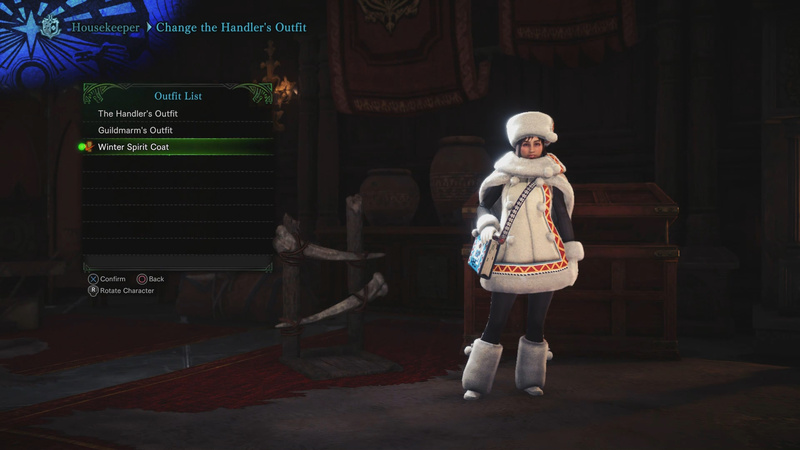 This is what the Palico Snow Set Alpha looks like. Bell: 1x Winter Star Ticket, 1x Carbalite Ore.
Head: 1x Winter Star Ticket, 1x Carbalite Ore.
Suit: 1x Winter Star Ticket, 1x Carbalite Ore.
Like previous events, the Winter Star Fest brings back a number of quests that had previously expired. 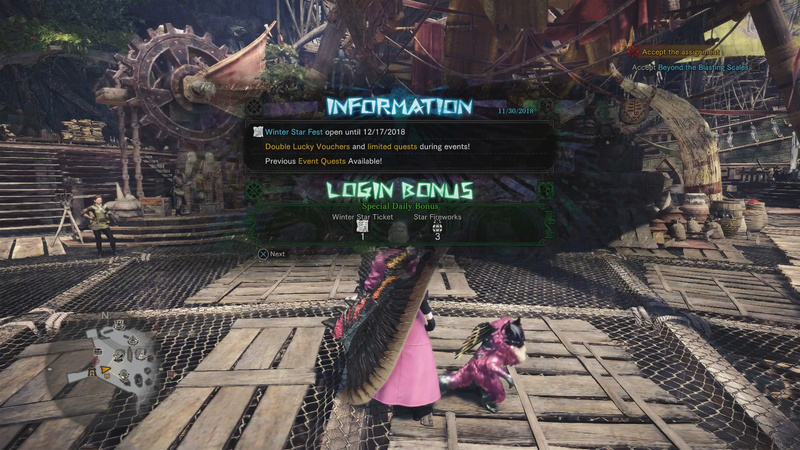 There have been a number of events which have occured since Monster Hunter World dropped back in January. Most of these events were on a short timer, meaning you probably missed a few. While the Winter Star Fest runs, you will be able to access all previous Events that have occured in Monster Hunter World. This means you will be able to get the Aloy gear, Street Fighter gear, or whatever else you may have missed. Thanks Capcom! Check out the Winter Star Fest background. What do you think of it? The Purrfect Reveal! pose is a new addition. 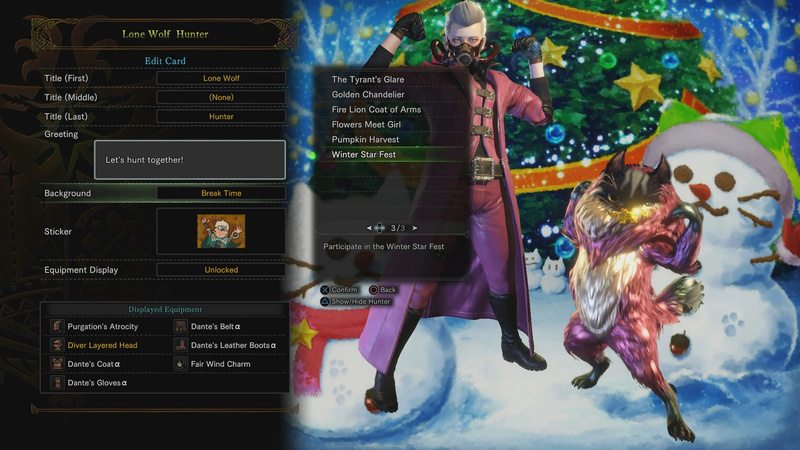 The Winter Star Fest includes a new background and pose for players to equip on the Guild Card. 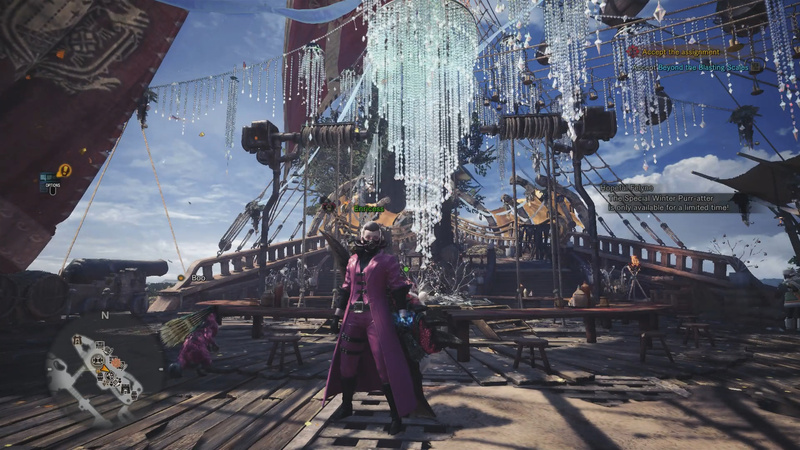 These new additions are festive in nature and can be accessed via Info > Guild Card > Edit > Background or Edit Pose. The background is called Winter Star Fest and the new pose is called The Purrfect Reveal! Equip these new additions if you want to get into the holiday spirit! In the Gathering Area, there are a number of festive changes to the area and NPCs. The last part of the Winter Star Fest I will highlight is that the Gathering Hub has been decorated for the occasion. In center of the Gathering Hub you will notice a giant Chandelier. Besides the giant Chandelier you may also notice that all the NPCs and the area itself are way more festive than normal. Besides these added visual flairs, there is a new Winter Star Platter which you can purchase from the Canteen. 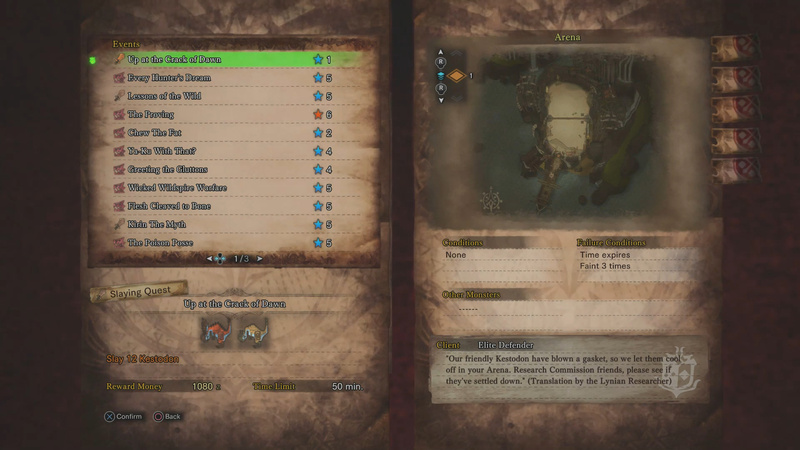 More: Monster Hunter World walkthroughs and guides. What do you think of this guide to everything in the Winter Star Fest? Let me know in The Pit below.